Like last week, I was up at 6AM and had the entire deck to myself. As Chief Mate Sergiy and I were talking, we saw a sea turtle swimming alone off the port bow. And a short while later, a porpoise followed the ship for a distance before dropping back. I was the only passenger to see them. Everyone else was still in their cabins, including Maureen, of Los Angeles, who wanted so badly to see a porpoise and had spent hours last week looking in vain. I climbed into the net for about an hour of communion with the sea. The Widow's Net hangs below the bowsprit for safety reasons. The crew has to climb onto the bowsprit to work the sails and could easily lose their footing in rough seas or wet weather. In good weather, passengers are allowed to climb out into the net and sit a few feet above the sea, oblivious to any sounds from the deck. Pure solitude, with only the sound of the ship's bow cutting through the water. We sailed into the Gulf of St. Florent and dropped anchor near the town of the same name. 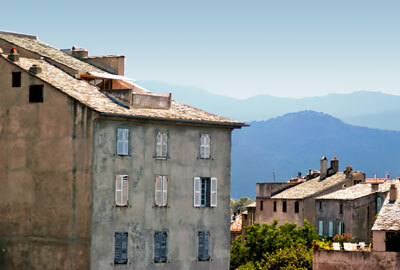 For centuries, St. Florent was a quiet, sparsely-populated village, unknown and ignored. But when a marina was built in 1971, the village blossomed into a port of call for yachts from the Côte d'Azur. It was discovered by le tout monde and became known as the "St. Tropez of Corsica." Not quite. Yes, there are some expensive yachts in the harbor and some quaint shops and restaurants lining the port. And off to the west, we could see hang gliders in the rugged hills of the Agriates. But there is no way this town can be compared to the one we visited just two days ago. Even in July, the St. Florent was not crowded. Arriving just as the shops were closing for lunch, we decided to hike up to the 15th century Citadel. We could walk along the ramparts but there was nothing unique or particularly interesting about the site. As usual, the heights provided nice views of the harbor below; and on the back side, we could see some beaches and private homes. We returned to the port and had lunch at U Furnellu. After a short exploratory walk around the town and out onto the sea wall, we were ready for gelato. It was getting pretty hot and we had seen all that St. Florent had to offer, so we bought some cold drinks and took the tender back to the ship.